Experience All India ITR IOS app to e-file your income tax return. We are a leading intermediator between the citizen and government for filing income tax return in India. It is free to download and readily available in your iOS app store. Our iOS app is designed specially to meet your need and make your income tax return e-filing easier. Both Individuals and businesses can file income tax return from anywhere and at any time without any hassle via our e-filing mobile app. Easy e-filing ITR: File your Income tax return with our app and avoid hassle. Depending on your choice our highly-advanced app will guide you till you finish your e-filing process automatically. Our software is tried and tested and is specially designed to make your income tax return filing process easy and rapid. HRA Exemption Calculator: You need to calculate your HRA correctly, if you are a salary personal or employee complying with the rent deduction slab, to obtain maximum exemptions. Use our HRA Exemption Calculator to obtain maximum exemption as we have designed our calculating software keeping in hand all the income tax laws. Income tax calculator: To obtain maximum deduction you need an exact and excellent income tax calculation. Income tax is generally the total amount of your basic salary, HRA, transport allowance, special allowance and all other allowances. You can benefit maximum deduction and exemption from the allowance by calculating your income tax accurately with a clear understanding of the possible deduction slab and tax laws. With All India ITR iOS app, the long and tedious procedure to calculate your income tax will be overruled by our Income Tax Calculator in our iOS app. It will calculate it for you automatically, easily with excellent results. Our income tax calculator is designed to provide you excellent results keeping in hand the various latest laws and amendments of the Financial Act. To calculate your income tax with our app, follow the guideline after providing the required details in the provided field. Our IT calculating tool is time-saving and easy to use. Rent Receipt Generator: It is compulsory to submit rent receipt along with the lease agreement and the Landlord’s PAN Card if your HRA is more than Rs 3000/- and rent is more than Rs. 8,333/-per month. You can generate your rent receipt with our iOS app, in the prescribed format to get the possible deduction on Income Tax e-filing. Generate and download the Rent Receipt after filling the details. Fill the information and click Generate and Print/Download your rent receipt. Blogs and News: It is very important to keep yourself update before filing any ITR. The laws of Income tax keep on changing / modifying as the situation demands. You can get updates on our everyday Income tax-related blogs and news. Feedbacks: The improvement of our service totally depends upon your feedback. Click Rate Us tab on our iOS App, choose the number of stars and share the feedback accordingly. Contact us: You can contact us anytime and anywhere with no effort. Our service is available 24 x 7. Check Refund Status: It is necessary to keep yourself updated with the return process after filing income tax return. The income tax refund process is a lengthy and time-consuming process, however, with All India ITR iOS App, you can track your refund status within a minute. You can access your refund progress information after 10 days from the submission of the refund claim. Note: At present, our iOS App do not support Check Refund Status. It will be available from 1st June’17. Q. What is the importance of using the iOS - Apps? You can use other means apart from iOS App, to file your income tax return. But, with this fast-growing world with iCloud spreads its wings, it is very necessity to have ITR filing iOS app. It is a convenient way to file your ITR with our iOS App anytime and anywhere with your iOS device. Q. Which device is this App applicable? 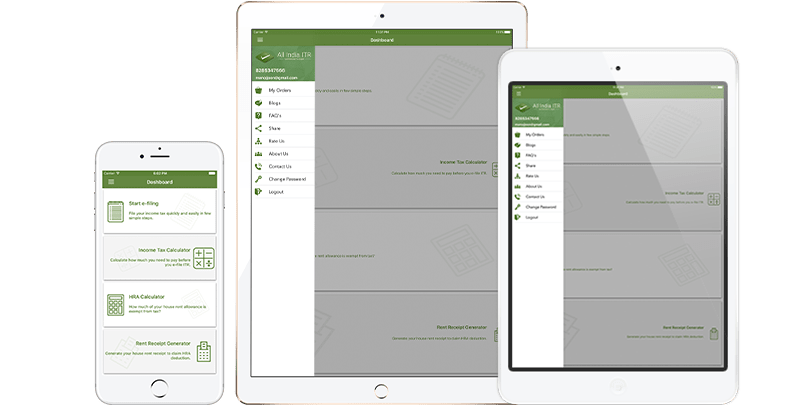 All India ITR iOS App can be used or applicable to any iOS device – Apple devices. Q. Whom shall I contact with questions related to iOS - App? iOS – App has been designated by All India ITR in such a way to help you understand the system easily. You can write to us at info@allindiaitr.com for more information. Q. What do I need to use the e-fling app? All India ITR iOS e-filing app operates on all iphones and ipads with iOS version 9.0 or above. Internet access and web browser on mobile devices are also required. Q. Do I need to register before I use the e-filing app? Yes, you must first register as All India ITR user before using the e-filing app. You can register at our website All India ITR or via our apps – IOS and Android Apps. Q. Will I get an acknowledgement after I file my e-return via iOS app? To know if your e-return is process by filing with our iOS app you can go to My Order and see your status. Cancelled, if your e-return is cancelled. Q. Whom shall I contact if I don’t understand the process? Our iOS App has been design to avoid any difficulty or difficult step to understand. However, if you face any difficulty to understand the functioning of our app you can write to us at info@allindiaitr.com. Q. In case, if I get an error message at the time of submission / uploading of return? Error in submission / uploading of return will not happen. If it happens it will be due to server issue or incorrect data or non-filling of mandatory fields. You will get a notification if it is server issue. Wait for some time and submit / upload return after some time. While using our app, this issue hardly happens. Recatify the errors until there are no further error messages, in case of incorrect data filling. Do not use any Special Characters such as -, _, &,!, ^, <,>, #, ~, %, or * while entering data since it may cause an error while generating XML file or while uploading the XML file. Q. Can I reset my password, if I forget my password or if I want to change my password? Yes, you can reset your password by clicking Forgot Password. Reset your new password by entering your mobile number and registered email address. Q. Can I crosscheck my Income tax calculated amount / HRA using the app? Yes, you can recheck the calculation, if you want to crosscheck your calculated amount / HRA after calculating the same using our app you can click Calculate Again and calculate your amount / HRA. Q. Whom shall I contact for any technical issue after paying the fees? You can write to us at info@allindiaitr.com. However, there will be no such technical issues. Q. Whom shall I enquire if there is any issue with the payment process? Normally, such issue hardly happens. In case if it happens, can write to us at info@allindiaitr.com. Q. If I think the calculation is wrong, what shall I do?